A high school art student at Circle Christian School in Winter Park captured top honors in the 2011-2012 manatee decal art contest sponsored by the Florida Fish and Wildlife Conservation Commission (FWC). Bekah Scoville, 14, created an image of two manatees swimming in water painted in pastel blues and greens. "It is encouraging to see this young woman use her talent to support such an important cause," FWC Commission Chairman Rodney Barreto said. "Bekah's design will help the FWC promote the protection of Florida's endangered state marine mammal." Since 1992, manatee decals have been available to Floridians registering their vessels or vehicles in exchange for a voluntary donation. Bonnie Abellera, the FWC's manatee decal coordinator, announced that Scoville's artwork will grace the 20th edition of the manatee decal, with the caption "Support manatee conservation." Decal donations raise approximately $70,000 annually for the Save the Manatee Trust Fund, which helps pay for the FWC's conservation efforts. The new decals with Scoville's art will be available July 1 at county tax collectors' offices. 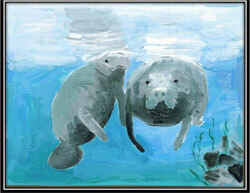 "I painted these manatees because I feel that they are gentle creatures," Scoville wrote on her contest entry form. "I love the scene of the mother and baby, and I feel that their love and affection toward each other is lovely to display in art." After the decals are printed, FWC staff will present Scoville with a framed decal, an award certificate and ribbon, and a one-year subscription to "Florida Wildlife" magazine to acknowledge her artistic contribution to Florida's manatee conservation program. Her art teacher, Laura Miller, submitted the ninth-grade student's work. Fifty-four students from 23 Florida high schools participated in the 2011-2012 contest. Provide a proper lookout for manatees when boating or enjoying any type of watercraft in Florida. Slow down and obey posted speed zone signs on the waterways. Watch manatees from a distance, and do not attempt to feed manatees, or any wildlife. Recycle monofilament fishing line, and do not discard into the water. To learn more, go to MyFWC.com/Manatee<http://www.myfwc.com/Manatee>. For information about the contest and all of the award recipients, contact Bonnie Abellera at 850-922-4330. Clearwater Regatta Promises Top Competition for Optimist Sailors: Jan. 18, 2012 Many of last year's sailors went on to qualify for North Americans, British Nationals, Asians, Europeans & Worlds.